Just as a fire pit or garden fountain may accent a particular aspect of the landscape, so can outdoor structures such as arbors, pergolas, decks, gazebos, and fences. Many landscape designs use outdoor structures such as picket fences to create 'outdoor rooms' or stained decks to create paths through the landscape. An ornate, metal fence or carved-limestone wall can be used to highlight the entry to the home while a more common board-on-board fence may mark a utility area such as a garage or tool shed. A redwood arbor can lead the way to a creek or perennial flower garden. 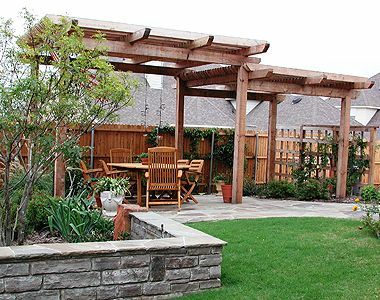 For a barbecue or garden party, a cedar pergola makes the perfect ceiling for an outdoor kitchen. A raised wooden deck overlooking a creek, pool or just the back yard sets the scene for a relaxing, outdoor living space. A strong and sturdy chain-link or vinyl fence provides security, privacy, and a natural border for your home and property. Outdoor structures are constructed of varying materials including deterioration-resistant woods such as cedar, pine, redwood, and pressure-treated wood along with plastic, composite materials, vinyl, fiberglass, iron, chain link, and stone. Something to keep in mind is maintenance. Non-wood products are more fade resistant and better weather the repeated effects of sun and water exposure. Wood products, on the other hand, may require extra painting, staining, and water-proofing to better combat exposure to the elements. Pricing for outdoor garden structures will vary based on the material and complexity of the project. 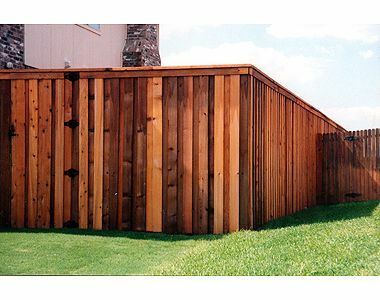 On the low end are trellises and arbors with pricing ranging varying from $50 on up to $800. Gazebos may run from $750 to $10,000. On the high end, more substantial structures such as pergolas and decks vary from $4,000 to $10,000. Wood structures built on concrete footings virtually eliminate wood rot and deterioration. Ask potential contractors if they provide this service. Any extra charges for this service may save you a lot of money in the long-run. Browse YardHookup.com and magazines for examples and pricing for Outdoor Structures. You can save valuable time and money prior to your consultation by sketching out ideas and drafting a list of thoughts for your project. Also, consider how much you would like to spend. Ask potential contractors if they have picture portfolio showcasing their other projects. Ensure you fully understand the contract along with any required maintenance and warranties.